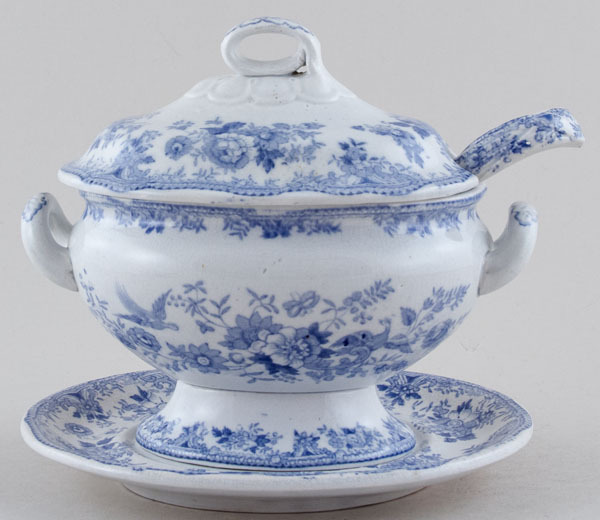 A delightful oval lidded tureen complete with stand and ladle. No backstamp. Stand is crazed and has a minor firing fault around the central indent. The tureen, lid and ladle all have light crazing with the tureen also having a little minor pitting underneath to the foot. Overall a lovely set. OVERSEAS SHIPPING OUTSIDE EUROPE Owing to the size of this item a supplement of � about US$39 will be added to the standard overseas shipping charge.